It is often easy to oversimplify the impact one little letter can have on someone. But believe me, the written word does make a world of difference. Like a kind pat-on-the-back or a congratulatory "good job" it can lift the spirits of just about anyone, and considering the struggles a man like Jackie Robinson went though as he traveled the wilderness of professional Major League Baseball during the age of segregation, he needed as much encouragement as he can get. 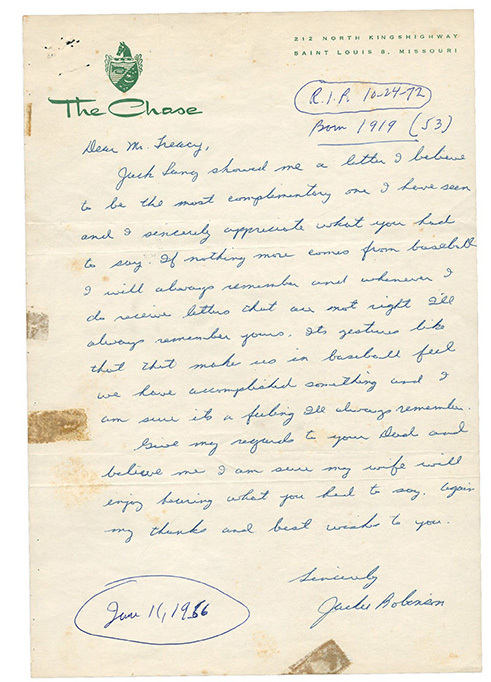 Featured in the current Lelands auction are the below letters showing one such example that by Jackie's own admission was the "most complimentary" one he had read. My father, Andrew Treacy of Merrick (age 75) and I (age 50) have been rabid Dodger fans since we were both 10 year of age. 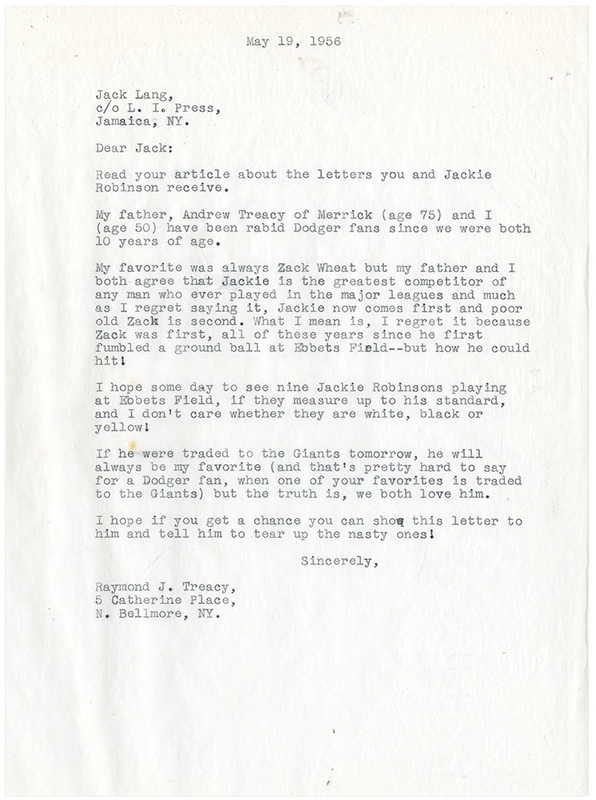 My favorite was always Zack Wheat but my father and I both agree that Jackie is the greatest competitor of any man who ever played in the major leagues and much as I regret saying it, Jackie now comes first and poor Zack is second. 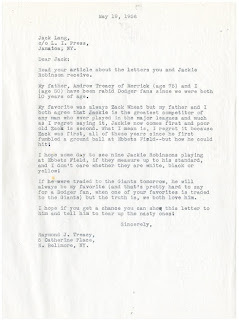 What I mean is, I regret it because Zack was first, all of these years since he first fumbled a ground ball at Ebbets Field -- but how he could hit! I hope some day to see nine Jackie Robinson's playing at Ebbets Field, if they measure up to his standard, and I don't care whether they are white, black or yellow! If he were traded to the Giants tomorrow, he will always be my favorite (and that's pretty hard to say for a Dodger fan, when one or your favorites is traded to the Giants) but the truth is, we both love him. I hope if you get a chance you can show this letter to him and tell him to tear up the nasty ones! Jack Lang showed me a letter I believe to be the most complimentary one I have seen and I sincerely appreciate what you had to say. If nothing more comes from baseball, I will always remember (your letter) and whenever I receive letters that are not right I'll always remember yours. It's gestures like that that make us in baseball feel like we have accomplished something and I am sure it's a feeling I will always remember. Give my regards to your Dad and believe me I am sure my wife will enjoy hearing what you had to say. Again, my thanks and best wishes to you.